In Tibet, the Maha Madhyamaka (Great Middle Way) is known as Zhentong (other-emptiness). It was elucidated in the scriptures of Maitreya, Asanga, Vasubandhu and Dignaga. It was also profoundly illuminated in Nagarjuna’s Praise to the Dharmadhatu. Zhentong was the viewpoint of both masters, Nagarjuna and Asanga. According to Zhentong, all the following are regarded as compounded and transient, and thereby unreal: the three uncompounded dharmas, regarded as unconditioned by all schools up to and including Yogachara, but which are actually imputed and insubstantial; all basic samsaric dharmas such as external objects, the eight types of consciousness, and the fifty one dharmas of mental events; and everything included in the path and result, such as all newly arisen aspects within the fruition of Buddhahood and whatever appears to those yet to be tamed. From the vantage point of ultimate truth, whatever appears as sight and sound, all the phenomena within dharma and dharmata, everything included in subject and object, are compounded and transient and thereby unreal. The ultimate truth is dharmadhatu and self-luminous awareness, which is non-dual pristine wisdom. This is called uncompounded dharmata. When examined by reason, nothing but this can be established as true. However, in the Rangtong (self-emptiness) way of comparing it to space, it is insubstantial; for that reason, they assert that it is not ultimate truth. All Mahayanists accept Mahayana sutras as the words of the Buddha. However, Yogacharins hold four sutras —Sandhinirmochana, Lankavatara, Ghanavyuha and Avatamsaka— as definitive and the rest of them as provisional. The founders of this school are the five hundred masters of the early Mahayana. The holders of the general Middle Way consider the Third Turning sutras as provisional and the Prajnaparamita sutras of the Second Turning as ultimate. The real founders of this school are Buddhapalita and so on. Their followers claim that the eight proponents of the ‘free of inherent nature,’ like Rahulabhadrika and Nagarjuna adhered to their view alone. The Great Middle Way bases its view on the sutras of all Three Turnings of the Wheel of Dharma. The view that establishes ultimate dharmata as true is presented in a general way in the following scriptures: Katyayana Sutra, Sunyata Nama Mahasutra and many other sutras from the First Turning; the Maitreya Paripricchanama Sutra, the Prajnaparamita in five hundred stanzas, and many other sutras from the Second Turning; and also many sutras from the Third Turning, including the four important ones mentioned above. The most definitive presentation of this subject is found in the Tathatagatagarbha Sutra, Mahabheriharaka Sutra, Angulimala Sutra, Srimaladevi Sutra, Mahaparinirvana Sutra, Ratnamega Sutra, Prasanta Vinischaya Sutra and so forth. Based on these sutras, the subtle and distinct view reveals pure dharmadhatu as Buddha-nature. 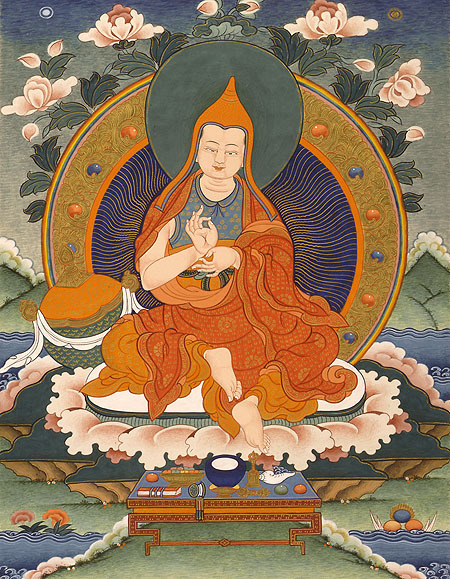 In a subtle and distinctive way, these secretly whispered teachings describe pure dharmadhatu, Buddha-nature, dharmakaya —permanent and unchanging— with all the ultimate qualities of the Buddha, primordially and naturally present. Buddha Maitreya was the author who elucidated the meaning of the sutras through His literature. In the Abhisamayalankara, he gave a brief and general explanation. In the Mahayana Sutralankara, Madhyanta-vibhanga and Dharmata-vibhanga, he clearly explained this view in detail. The extraordinary and most subtle view of these essential sutras is presented in the Uttaratantra. Asanga and Vasubandhu wrote commentaries on these texts. In Asanga’s commentary on the Uttaratantra, this extraordinary view is utterly clear and elaborate. In their entirety, the commentaries of these two brothers clearly elucidate the Great Middle Way. In Vasubandhu’s commentary on the Prajnaparamita in 20,000 stanzas and his commentary on the Dharmata-vibhanga, the Zhentong view is extensive and exceedingly clear. His disciples, Dignaga and Sthiramati, and many other good students in his lineages taught widely the doctrine of general Zhentong. The subtle Zhentong, since it is difficult to fathom, was spread by ear to ear transmission only to the best students. Later, there emerged many in India who confused the Great Middle Way and Mind Only (Chittamatra) schools. For that reason, the majority of Tibetans misunderstood them as the same. In Tibet, a variety of scholars translated these texts, but translators like Zugawe Dorje and Tsen Khawoche, who were within Maitreya’s meditative lineage, held the pure view. The omniscient Dolpopa Sherab Gyaltsen spread the lion’s roar of the distinctive and profound Zhentong across the land. That does not have both. And that is also there. In that way everything is explained. That is the Middle Way. While defining the relative truth, impure perception which gives rise to appearance exists on a relative level. Subjective and objective appearances which are manifested to that are just imputations of the mind. For that reason, these are not real, even at the level of relative truth. Therefore, relative truth is freed from both extremes. By accepting that conceptual mind only exists on a relative level, one is freed from the extreme of nihilism. By transcending the imputed subjective and objective poles, one is freed from the extreme of eternalism. The primordial wisdom of emptiness is free of contrivance. It is truly and naturally present within our impure perception and consciousness. When dharmata is covered, obscured consciousness remains as temporary and removable, and the defilements are unreal. Therefore, it is said that ultimate truth is also freed from both extremes. Because emptiness is truly established and all dharmas —like concepts within the range of subject and object— are unreal, ultimate truth is beyond the extremes of ‘is’ and ‘is not,’ eternalism and nihilism. Therefore, subjective and objective duality of the relative level is only deluded appearance. Because nothing is independently established, it is empty of self-nature. When divided into self and other, it is not possible to be another’s nature. Therefore, it is never non-emptiness. The nature of primordial wisdom is ever-present and never changes. For that reason, it is not empty of its nature; it is permanent. Generally, if it is empty and emptiness, it need not be empty of its own nature. Primordial wisdom is empty of all contrivance and dualism which is other than its own nature. That is why it is empty. The three natures are the imaginary, the dependent, and the perfected. Whatever is grasped by mental designation is the imaginary nature. Non-entities and the appearances of objects arising in the mind are imaginary. The relationship between name and object, such as grasping the name as the object or mistaking the object as the name, are also imaginary. Outer and inner, fringe and center, big and small, good and bad, space and time, and so on, whatever is grasped by thought is imaginary in nature. The dependent nature is simply consciousness, which arises as subjective and objective poles, based on the habitual tendencies of ignorance. The perfected nature is self-aware, self-luminous, and free from contrivance. The synonyms of the perfected nature are dharmata, dharmadhatu, suchness, and ultimate truth. The dependent and imaginary natures are equally false and relative. However, it is necessary to separate them into individual categories. The imaginary nature does not exist even on a relative level. The dependent nature exists on a relative level. The perfected nature does not exist on a relative level, yet it truly exists on an ultimate level. Therefore, imaginary nature exists by designation, and the dependent nature exists as tangible. The perfected nature does not exist in either of these two ways; rather, it exists in an uncontrived way. The imaginary nature is non-existent emptiness. The dependent nature is existent emptiness. The perfected nature is ultimate emptiness. It is said that one understands emptiness. The imaginary nature has no characteristics. The dependent nature has no arising. The perfected nature ultimately has no nature. These are the three non-natures. By establishing the non-natures of the three natures. According to this system, all phenomena are permeated by emptiness and free of inherent nature; therefore, all phenomena are empty and non-empty. This is the Zhentong view. And Zhentongpas are the real exponents of ‘free of inherent nature.’ The Rangtong masters, like Bhavaviveka and Buddhapalita and others, are considered the main teachers of the ‘free of inherent nature,’ based solely on popular belief. Is the perfected nature real? Does it arise, dwell, or cease? Does it come or go? Is it changeable? Is it space or time? Is it one or many? It is none of these. If all of those qualities are present, then the perfected nature would not be real. The perfected nature is unborn, non-dwelling, and unceasing. It does not come or go. It is not one or many. It has no cause and no fruition. Within itself, it is free of the characteristics, the qualities, and basis. It is beyond all space and time. Within itself, it is free of all relative phenomena. It is indivisible because it cannot be separated into distinct parts. Because it is the nature of all phenomena, it is ever-present and all pervasive. Secondly, we will discuss the meaning of the Great Middle Way. In all suchness there is no differentiation. All beings have the essence of that. Suchness and the Tathagata are of the same stuff which is called Buddha-nature. The meaning of Tathagatagarbha, Sugatagarbha, and the essence of the Buddha is the same. That abides equally in the Buddha, in all phenomena, and in all sentient beings. In sentient beings, Buddha-nature is present as a seed. In the Buddhas, Buddha-nature is completely actualized. The ultimate Buddha is the same as the seed in the mindstream of sentient beings. Therefore, all sentient beings have Buddha-nature. The Buddha-nature that is in sentient beings is called gotra and dhatu. If the Buddha-nature in the Buddha is not like a seed and Buddha-nature in beings is like a seed, are these not two different things? No. Buddha is suchness itself. Even when we talk about Buddhas as people, to them Buddha-nature is not hidden and has become actualized. And when we talk about a seed, it gives a meaning of something hidden inside and therefore does not apply to the Buddhas. Although that suchness of the Buddhas always abides in sentient beings, because beings do not see it, it can be described as hidden or as a seed. When the seed is described as unchanging, then it can be said that Buddhas also have the seed of Buddha-nature. For that reason Buddha-nature is free from both entity and non-entity; that is why it is truly unconditioned and ultimately uncompounded. In the most profound and subtle understanding, there is no dispute that the dharmadhatu of the Buddha is naturally present with all the qualities of the Buddha. That is inseparable from the dharmadhatu of sentient beings; therefore what is wrong if we say that Buddha-nature, which is in sentient beings, is also present with all the qualities of the Buddha. Luminosity is uncreated, inseparable and all-pervasive. Than the grains of sand on the banks of the Ganges. Thus, if the seed of the Buddha is present with all the unconditioned qualities, it has all the qualities of the ultimate Buddha. The wisdom of all-pervading space (dharmadhatu) entails only ultimate truth. Although the other four wisdoms are mainly ultimate because of primordial nature, they have certain aspects which are newly attained through the practice of the path and which are relative. The ten powers and the four fearlessnesses are similar. Physical qualities such as the major and minor marks, and the sixty attributes of speech, are relative and absolute in equal aspects. The svabhavikakaya is nothing but ultimate truth. The dharmakaya is predominately ultimate. As long as we do not differentiate real and imputed, sambhogakaya and nirmanakaya are relative and absolute in equal aspects. What appears to others as Buddha activity is relative. The potency and power of wisdom are absolute. The ultimate aspect of the kayas, wisdoms, qualities and activities is primordially present in Buddha-nature. When an individual becomes enlightened, these are not newly attained; they are just freed from the stains that obscure them. Whatever is newly attained is the relative aspect. The ultimate aspects of the qualities of past and future Buddhas are the same nature. The relative aspects of those are also the same after one attains enlightenment, but at the time of enlightenment they are different. Therefore, it is impossible to say that the nature of relative qualities is the same or different. What is newly attained, or generated by practicing the path, is called the ‘generated result’; it is not real. The ‘liberated result’ occurs just by removing obscurations from the primordially abiding Buddha. It is not really cause and effect. It is just called ‘liberated cause’ of the path as a description. The liberated result is explained in the Abhidharma: “When intellect is exhausted, that is freedom.” This is not the cessation of all mental activity. In the Dharanisvaraja Sutra it says, “It is primordially exhausted, therefore it is called cessation.” This is the ultimate liberated result and the truth of cessation. If you ask: is removing obscurations the same meaning as ‘exhaustion of intellect’? The answer is no. From the vantage point of dharmadhatu obscurations are not removed; removing is from the individual point of view. One may sometimes use the term ‘exhaustion of intellect’ to refer to the time of enlightenment, but actually there is nothing to exhaust. Dharmadhatu is primordially pure because it has never been stained; for that reason cessation is not newly created by mind. Buddha-nature which is non-dual wisdom permeates all phenomena equally. It is ornamented with all the ultimate qualities of the Buddha. The great perfected nature is unchanging and free from all contrivances; it is endowed with all aspects of wisdom. This is the only unmistaken reality. The wisdom of the noble ones is undiluted and truly established by experience. Since it is unchanging, it is permanent, stable, and enduring. Buddha-nature and its qualities such as the marks and signs were taught in the tantras of the Secret Mantrayana in their entirety. Whatever is called relative, dualistic, and diluted appearance, or in short, all phenomena of sight and sound, cannot stain the perfected nature. The perfected nature does not exist separately as untarnished dharmadhatu, but really abides in relative truth. The imaginary nature is just diluted appearance. Since reality is like the hare’s horns, it is unstained because there is nothing to be stained. Buddha-nature, the perfected nature, is never empty of itself. All that is other and relative is primordially empty. Ultimate truth, the perfected nature, is Zhentong ‘empty of other’ not rangtong ‘empty of itself.’ What is relative is empty of other-nature as well as empty of self- nature. What is ultimate is empty only of other nature. This way of teaching is called the Great Middle Way. In order to overcome the attachment to worldly dharmas, we practice the renunciation of suffering and impermanence. To renounce selfishness one should bring bodhichitta into the mindstream. In order to renounce gross attachments to relative phenomena, we meditate on understanding relative truth as unreal. In order to renounce subtle attachments, we meditate on non-thought by dissolving relative thoughts into space. Through practice we will gradually see the face of Buddha-nature, which is non-thought. Whatever path we practice, the purpose is to see the perfected nature. Now, we will refute the criticisms by others of the Great Middle Way. Although criticisms are addressed in detail in The Ornament of the Great Middle Way, here I include an abbreviated version. Others quote the Lankavatara Sutra to say, “If Buddha-nature has all the marks and signs, how is it different from the ‘soul,’ or Atman, of non-Buddhists? In reply the Buddha said, “It is not the same because of emptiness.” Others interpret the sutras to say that Buddha-nature is unreal; if it had marks and signs it would be analogous to non-Buddhist traditions. Buddha-nature, they say, is insubstantial like space. To them we reply: to think everything which is empty is untrue, insubstantial, and non-existent is a fault of attachment to your own inadequate doctrine. The reason Buddha-nature is not analogous to non-Buddhist traditions is this: the sutras say the marks are empty, but they do not say that they are not present. To say that Buddha-nature with its radiant, perfected marks and signs is provisional is nothing more than deception. Anyone who criticizes the proponents of ‘the permanent nature’ as non-Buddhist likewise reject the Tatagathagharba sutras. It is also incorrect to say that the meaning of permanence refers to continuity. The continuum-permanence is even in samsara and duality. If permanence referred to continuity, then all compounded things would be permanent. If you think that first it was defiled and later it became pure, it follows that it is impermanent. From the vantage point of dharmata, first it was not impure, later it did not become pure. Whether it seems defiled or pure depends on the individual’s mind-stream. Just because individuals change their perspective, it is wrong to conclude that dharmata is changed. If people find it unreasonable that sentient beings have the Buddha’s wisdom in their mind-stream, they are contradicting the Buddha’s direct statement “The Buddha’s wisdom resides in the multitude of sentient beings.” They also say: it is incorrect that sentient beings have the Buddha’s qualities, because if sentient beings have the ten powers of wisdom in their mind-stream, then they should have the full power of discrimination. What they say is not correct, because we do not assert that everything in the mind-stream of sentient beings is Buddha. If Buddha-nature and its qualities, remaining in the mind-stream of sentient beings, makes sentient beings omniscient, then the Buddha sitting on his throne, would also make the throne omniscient. Of course the eight consciousnesses, in the mind-stream of sentient beings, are not Buddha. The Buddha which remains in the mind-stream of sentient beings is not there as something within something else on a relative level. It remains there as its nature on an ultimate level. Let’s briefly review the Three Turnings of the Wheel of Dharma. First is the Turning of the Four Noble Truths. Second is the Turning of Emptiness. The Third is the Turning of Full Revelation. The First Turning consists of the sutras taught to the Shravakas, or the sutras of the Hinayana. The Second Turning consists of the root sutras of the Mahayana, but certain points are not fully revealed. The Third Turning is like the commentary of the Second, where the most definitive teachings are fully revealed. Each of three natures —imaginary, dependent, and perfected— have two aspects. The imaginary nature consists of the subjective and objective imaginary natures. The dependent nature consists of the impure and pure dependent nature. The perfected nature consists of the unchanging nature and the unmistaken nature. The actual imaginary nature is the objective aspect. The actual perfected nature is the unchanging aspect and not the unmistaken aspect, though they are the same nature. The unmistaken aspect of perfected nature is included in the pure dependent nature. The subjective part of the imaginary nature and the dependent nature are identical. If examined by reason, the actual dependent nature is included in the imaginary nature, but its natural state is the perfected nature. Therefore, all phenomena are included in the perfected and imaginary natures. All phenomena of samsara and nirvana are classified into the three natures or the two truths, relative consciousness and ultimate wisdom. Relative perception of form, sound, touch, smell, and so forth is unreal. The natural state of the sights and sounds are within the aspect of primordial wisdom. Therefore, they are real. In this way there is no contradiction between relative and ultimate truth. Excellent teachings here, on an excellent website! Yes, it is so important to realise that only the non-Buddhic (the samsaric) is impermanent, painful and not-the-Self. But the eternal Buddha – present in all beings, all things and in all times and beyond, as the ‘Buddha-dhatu’ (Buddha Principle) – is truly Real and the only genuine Self that can ever be known or seen. This is the teaching of the great ‘Mahayana Mahaparinirvana Sutra’ and the ‘Angulimaliya Sutra’ (amongst others), and finds admirable embodiment in the teachings above. I encourage all to please visit Dr. Tony Page’s http://www.nirvanasutra.net –an excellent website which presents an antidote to the nihilism that poses as and passes for Buddha Dharma in our Dharma-ending days. It presents the highest teachings of Buddha Shakyamuni and those great Masters who have transmitted these teachings. Excellent article, Tashi Nyima! It is sad that (on so many sides) people are choosing to obfuscate this most important teaching. And, also, thanks to Dr Page for the excellent website and YouTube videos. It is good to know that persons will be able to acquire this information for themselves even if their teachers / lineages are not wont to teach it. Thank you Tashi Nyima for these excellent teachings. It was actually through the website and videos by Dr.Tony Page, that I discovered the works of Dolpopa and the Jonang lineage. I would dearly like to commence a daily practice based on these wonderful teachings. Currently I’ve had no formal empowerments or even personal contact with a teacher so I practice the six syllable Mani mantra as much as possible. Any help you can offer would be most helpful. Thank you. I have sent an email. great site.Thank you for all this useful info!